While residents and businesses of Rhode Island and Connecticut are looking to FEMA for help after flooding, those in California are screaming because new FEMA flood maps may mean they have to buy flood insurance for the first time. FEMA is updating flood hazard maps nationwide. 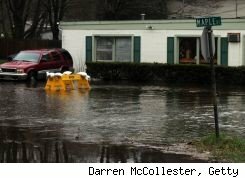 After the update, if your home is deemed in a high flood risk area, you could be required to buy flood insurance. Most mortgage companies will not let you close on a home without flood insurance if your home is deemed by FEMA to be in a flood area. If you are determined to be in a flood area after the purchase and you don't get flood insurance, mortgage companies can buy it for you. You definitely won't have a choice if your loan is backed by the federal government -- Fannie Mae, Freddie Mac or the FHA -- and you're in a FEMA flood area: You will be forced to buy flood insurance. Home insurance does not cover you for floods, but may cover you if the insurance company determines the cause of water damage in your home was because of a backup of sewers and drains, as long as you have that endorsement. People who have survived a flood, but with severe damage to their homes, quickly find out the value of FEMA flood insurance. All flood insurance is backed by FEMA but sold by your insurance agent. Flood risk can, and does, change over time. Flood risks can change for many reasons, including new development, changes in levee classification and environmental changes. That's why FEMA is now updating maps nationwide. These new flood maps, also known as Digital Flood Insurance Rate Maps (DFIRMs), show flood risk at a property-by-property level. You can check the status of your area by entering your zip code at the FEMA Web site. I checked my area in Central Florida and found out that the projected date for a preliminary map is 9/30/2010 and the effective date for that map is 9/29/2011. Knowing your effective date can help you plan ahead. If you find out you will be deemed at higher risk when looking at the preliminary map, and you currently are in a low risk or moderate risk area, you may be able to save a lot of money for many years by taking advantage of the Grandfather Clause. Using the Grandfather Clause, you can lock in a lower rate if you buy a policy before the new maps take effect. As long as you are currently deemed to be in a low risk area, you'll likely qualify for a Preferred Risk Policy, which covers your home and its contents for as little as $119 annually in the lowest risk areas. Then when renewal time comes up, you will qualify for standard rates associated with moderate to low-risk zones, rather than the higher rates, which could range from $500 to $1,700 annually in high risk areas. To purchase a policy before the new maps take effect. If you have proof that your home was built in compliance with the flood map that was in effect at the time of construction. Your insurance agent or builder can help produce the necessary documentation. If your home has been in a high risk area and the new maps show you moved into a lower risk area, thanks to construction of water control facilities in the area or for other reasons, then you should be able to lower your flood insurance rates. So call your insurance agent after the maps go into effect to see if you can qualify for lower rates. You also can appeal a decision made by FEMA, but you'll need to hire a surveyor to prove your case. That could cost you about $1,000 to $1,500. But if you believe that FEMA incorrectly identified your home as a flood risk, it could save you a lot of money in flood insurance premiums over the years. Right now you can't buy flood insurance because it's been temporarily suspended. Congress failed to pass an extension for the flood control program, so it expired March 28. It will be at least two weeks before policies can be sold again. That's when the Senate will likely take up the bill. Lita Epstein has written more than 25 books, including "The 250 Questions Everyone Should Ask About Buying Foreclosures" and "The Complete Idiot's Guide to Personal Bankruptcy."